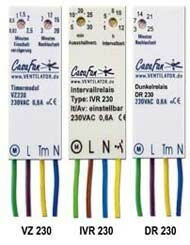 The CasaFan IVR 230 interval control unit is perfect for making sure that rooms which might not be used frequently still receive regular intermittent ventilation. The fan is activated by the adjustable interval and operates for 5 to 30 minutes, depending on your settings. The fan will also begin to run for the preset time once the light switch (on/off switch) is used. Due to its small size the control unit fits directly into outlet boxes or inside the fan itself.